Myth: Duck’s quacks and wolf’s howls don’t echo. First, it was commonly held that a duck’s quack didn’t echo. The earliest place I could find where this myth was debunked was by Cecil Adams of the Straight Dope in 1998. In his experiment, he and a few others took a duck to a place where it was easy to produce echoes and made the duck quack (after quite a bit of work as it didn’t want to quack at first). Sure enough, when it finally did quack, it echoed just as well as any other sound. This myth was once again debunked, this time in a much more scientific manner, in 2003 by a team of researchers at the University of Salford. Not to be left out, Myth Busters threw their significantly less scientific hat in the ring, later that same year, and once again showed that a duck’s quack does indeed echo. According to acoustic expert Professor Trevor Cox, who was part of the aforementioned 2003 Salford University study, this myth probably arose from the fact that the manner in which a duck quacks, with a long “aaaaaccckkkkk” at the end, often masks any echoes that are produced, making them harder to distinguish from the echo. So basically, as a duck is quacking and the sound is echoing and fading away, it simply sounds like one big long quack, instead of a quack and an echo, as you actually may be hearing. Once that myth was thoroughly debunked, a new one popularly popped up, this time courtesy of the Animal Planet in 2003. In a show where they were touting “50 facts you never knew about animals”, they dropped the gem “A wolf’s howl doesn’t echo”. Presumably the person in charge of coming up with those “facts” ran out of interesting things to say, so just started making some up. This is, of course, false. All sounds will echo, given the right environment, namely: a good medium with which to reflect off of that is close enough where the sound is still audible when reflected back and also far enough away that the echo is perceptible (must be a delay of over 1/10th a second for the human ear/brain to distinguish it from the original sound). This myth was popularly spread, courtesy of the above show on Animal Planet in 2003, shortly after the debunking of the duck quack/echo myth. The previous origins of the wolf howl/echo myth probably come from the fact that wolves often howl in the forest. The forest doesn’t provide a good medium for producing echoes. Rather, sound tends to get absorbed, rather than reflected. Also, it could come from the fact that, when you are close enough to a wolf to be able to discern an echo from the source, you probably aren’t paying a lot of attention to echoes and the like. If you are not close enough, due to the way the wolf howls, you are very likely to think you are hearing multiple wolves, instead of just one. Put a wolf in a canyon or near a rock face and their howls echo just as well as any other sound. In fact, wolves actually use this reverberation as a defense mechanism. They will often howl in wavering or modulated tones, rapidly changing the pitch. They use this trick to make neighboring packs, or anything else nearby they perceive as a threat, think there are more of them than there are. In this case, a few wolves in a small pack will howl all at the same time changing pitches very rapidly. This, combined with potential reverberation, will often make an enemy think there are more of them and, with the echoes, often that there are wolves all around. During the Civil War, Ulysses S. Grant once observed this when he reported thinking there were 20 or more wolves surrounding him, only to find out that it was just two wolves that were in front of him that changed their pitch rapidly; the echoes coming from all around him made it seem like he was surrounded. So next time you hear anyone say “X animal’s howl/quack/cry/chirp/etc doesn’t echo”, it is a lie. All sounds echo. There is such a thing as destructive interference where colliding waveforms cancel each other out, but the odds of any animal being able to produce this effect with any regularity in varied environments is exactly zero. Sound travels at about 1100 ft/s. So if you are standing next to the source of the sound and you hear the echo 2 seconds later, the sound is being reflected off something about 1100 ft away (one second there, one second back). About the closest echo that is humanly perceptible will be around 50-ish feet away. This number varies somewhat based on various factors, but that’s a good ball park number. The word “echo”, as we use it, comes from Greek mythology. Echo was a Nymph whose job it was to talk to Hera constantly while Zeus was having affairs, thus distracting Hera. When Hera found out, she cursed Echo to only be able to repeat what someone else had said, thus, the word “echo”. Wolves take howling very seriously. For instance, if lower ranking wolves in a pack (usually young ones) choose to join in on the howling at inappropriate times, they are punished severely for this, as it may put the whole pack in danger. Wolves often howl during a hunt to coordinate their efforts, such as to communicate where the thing hunted is or where each member of the rest of the pack is at any given moment. During a hunt, they are often all spread out over great distances. The typical low pitch and long duration of a wolf’s howl produces sound waves that are well suited for transmitting sound at great distances through even dense forests. The wolves also use their howls to help locate one another when they are lost or in an unfamiliar environment. Whenever a wolf is separated from their pack, they will typically begin howling right away to try to locate the pack as well as to let the rest of the pack know where they are. The problem, of course, is that neighboring packs also hear this howl and recognize the wolf howling as being outside of their pack. This is one of the reasons that the primary cause of death among wolves is being killed by other wolf packs. This is why, once the wolf knows where the rest of its pack is, unless it’s on a hunt or the like, it will typically stop howling. Also, even if it is on a hunt, if it detects an enemy pack nearby, it will stop howling and attempt to quietly slip off before it is noticed or located. On the flip side, young pups will howl at anything and will howl often. 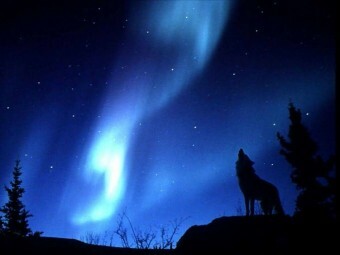 They haven’t yet learned to recognize the howls of their own pack, so respond to any howl they here. They also don’t realize the danger inherent in letting others know exactly where they are. Wolves never howl at the moon. As noted, howling can be dangerous for them, so they only do it when they must, for communication; finding out where they are, relative to the pack; and for scaring away potential threats. @Cynic: 🙂 Thanks for catching that. Fixed!